Welcome to the Fall Foliage and Festival Report for the weekend of Oct. 28 and 29, brought to you by the Maryland Department of Natural Resources and Maryland Office of Tourism. Well, this is the weekend for ghosts, goblins and other fright-worthy tricks and treats, and there are lots of Halloween events for everyone to enjoy! For leaf peepers the fall of 2017 has been more trick than treat. As a result of a lengthy drought and unusually warm weather, Maryland and our sister states have not earned any seasonal bragging rights this year. That does not mean one should stay home and sit by the fire. There is still plenty of gorgeous scenery and eye-catching vistas to behold and fall festivals go on regardless of the color of falling leaves. In western Maryland, Garrett County is well past peak while Allegany County is nearly at 50 percent, but unfortunately colors are not vibrant this year. Most of the ridges popped over the past weekend in Washington County and fall foliage may well peak there in a few days. Though not the spectacular arrangement of color seen in years past, the oaks have bronzed and yellowed. Visitors traveling to Allegany County will get a treat along I-68. Further east, maples are showing some color in Hagerstown and along South Mountain, but there’s still a lot of green to be seen. Frederick County is sporting lots of yellow patches, but again colors are muted and there are not many reds to be seen. In Carroll County, the cherries and sumacs are turning orange and red. Maples are showing color and with cooler temperatures expected the oaks will soon follow. There’s also a lot more color this week in Montgomery County, with hickories and maples dominating and understory canopy starting to peak as well. In Prince George’s County, the red buds are turning yellow and sweet gum is in full autumn foliage. Oaks are beginning to turn while the black gum and honeylocust have dropped their leaves. Baltimore, Cecil and Harford counties report hickory and yellow poplar are adding bright yellow and golden tones, with black gums and red maples contrasting with deep red color. Of the maples, several of the reds are first to change, with bright red leaves here and there. Sugar maples are starting to color and will soon reach their orange glory, but many are losing their leaves. Most hawthorne have already dropped leaves and red bud are quickly yellowing and dropping their large heart-shaped leaves although their seed pods persist. Elk Neck State Park and Fair Hill Natural Resource Management Area are both reporting good color. Elk Neck’s foliage is about 50 percent and the ash, dogwoods, hickories, maples and oaks are turning vivid shades of orange, red and yellow. Fair Hill’s oaks, poplars and sycamores are approaching full color and this would be a great weekend to hike the park’s spectacular panoramas. The Appleton Road parking lot north of Route 273 would be a good place to start. 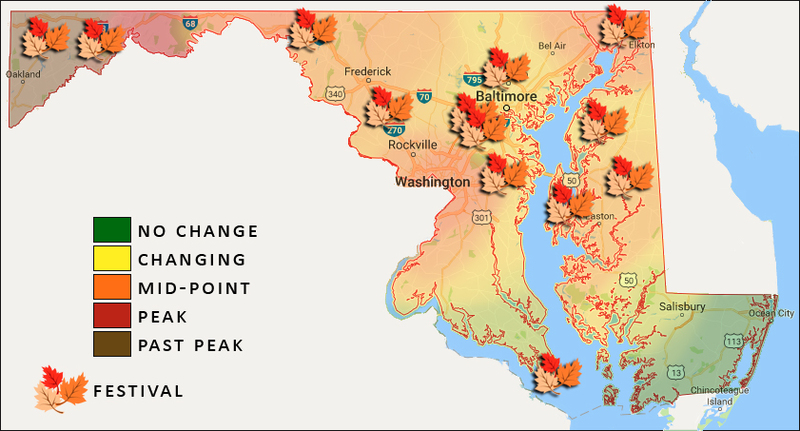 The vast overview of the forest still has a strong green tendency in the two upper Eastern Shore counties, Kent and Queen Anne’s. The black gums still have quite a few red leaves on them as well. Dogwoods have turned deep burgundy. October red sunset maples are turning an orange red as are most of the red maples which are starting to offer some color. The black walnuts have lost all their leaves. Some of the oaks are turning brown and some of the cherries are turning yellow. On the mid-shore, black gums are peaking a crimson red to purple with red maples coloring up steadily with a few peaking yellow to bright red. Sassafras is orange along roadsides and tulip poplars are beginning to turn yellow. Sweet gums and hickories are about mid-way, providing great color contrast with purples, butter yellows and russets. We are just starting to see hints of fall in the maple and sweet gums trees in Tubman country and along the far Lower Eastern Shore, you will find a bit of color, as the foliage is just beginning to change. Along the western shore, there are some slight and muted changes, as leaves have just begun to turn yellow, with peak still a few weeks away. Poplars and sweet gums dominate. Surely Washington County takes the spotlight this Saturday. 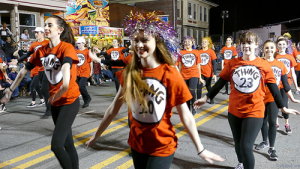 The largest nighttime parade on the East Coast, the annual Alsatia Mummers’ Parade, steps off down Potomac Street in Hagerstown at 6 p.m. The lavish event features bands, floats and mummers in outrageous feathered garb. In western Maryland, check out the Mountain Maryland Studio Tour, a self-guided tour Saturday and Sunday, from 11 a.m. to 5 p.m. Enjoy driving around the beautiful countryside and explore its charming towns while visiting the studios of talented artists in Allegany and Garrett counties. This is a great way to take advantage of early holiday shopping for distinctive one-of-a-kind Maryland gifts. A reading of Washington Irving’s masterpiece, The Legend of Sleepy Hollow, will be held Saturday at 1:45 p.m. at Garrett College in McHenry. Everyone loves a spooky tale about things that go bump in the night, especially when the tale is full of good humor and beloved characters. 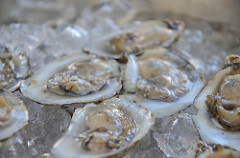 On Saturday, from 10 a.m. to 4 p.m., the Chesapeake Bay Maritime Museum in St. Michaels is hosting OysterFest, a celebration of the Maryland’s beloved bivalve. The event features live music on two stages, an oyster stew competition, boat rides, retriever demonstrations, local fare and cooking demonstrations, along with children’s activities. And at Tuckahoe State Park in Caroline County, enjoy a Family Fun Day on the Challenge Course Saturday from 11 a.m. to 2 p.m. Children and grown-ups alike will enjoy spending a day on the course’s high elements: 40-ft. rock wall, tube net, zip line, 50-ft. giant swing and 25-ft. pamper pole. Registration is recommended. Please call (410) 820-1668. Central Maryland is in full Halloween mode this weekend with numerous festivals and hikes, creepy crawlers and even a full moon event! The Howling Halloween Hullabaloo, a guided trick-or-treating adventure Saturday from 4 to 7 p.m. will take you through the Robinson Nature Center and its wooded trails in Howard County. Each stop covers topics from creepy crawlies to constellations. Live music, games, moon bounces, free balloon animals, raffles, local vendors and plenty of family fun await you at the ninth Annual Cockeysville Fall Festival Saturday from 10 a.m. to 4 p.m. in Baltimore County. Spend time Saturday from 2 to 4 p.m. in Patapsco Valley State Park exploring Spooky Spiders, and discover these wonderful web spinners and why they are important to our environment. In Montgomery County, Seneca Creek State Park will host a Costume Hike Sunday from 3 to 4:30 p.m. The 1.2-mile hike will celebrate the fall season. Dress up in comfortable festive clothing or even a Halloween costume! Wear walking shoes and bring plenty of water. Come along on a morning Foliage Hike Saturday from 7:15 to 8:30 a.m. at the Merkle Wildlife Sanctuary in Upper Marlboro. 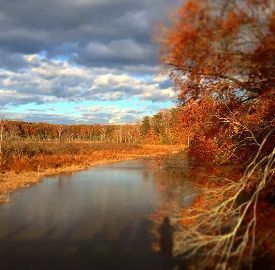 Hike the Poplar Springs Trail and take in the glorious fall colors. On Saturday evening from 6 to 9 p.m. join in a worldwide celebration of our nearest neighbor, the moon! View the night sky through telescopes with the Delaware Astronomical Society at International Observe the Moon Night at the Fair Hill Natural Resources Management Area in Cecil County. Registration required. In Southern Maryland, Invasion! The War of 1812 at Point Lookout will be held at Point Lookout State Park this weekend in St. Mary’s County. Learn more about how Point Lookout was involved in the War of 1812 and a target of British raids. Experience American and British camps, period weapon demonstrations, drills and other living history programs throughout the day. For more information or to see a full listing of Maryland Department of Natural Resources events and programs, please check out our new interactive calendar. 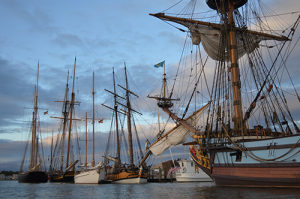 For more information on events around the state, please visit the Maryland Office of Tourism. 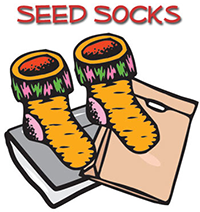 Just grab an old pair of socks – the fuzzier the better. Find a field or lawn that hasn’t been mowed recently. Put the socks on over your shoes and take a hike through the field. The longer you walk, the more seeds you will collect.